Fragrant and fruity on the nose with vanilla, apricots and a touch of bananas. Notes of malted barley arrive, lingering nicely with grassy tones and a hint of oak in the back. The high alcohol content is always present, but not really pungent. Strong and intense on the palate with a sweet start of vanilla, followed by yellow fruits - apricots and subtle pineapples. Very warming with white pepper and oak spice. Once the warmth fades, creamy notes of honey and a touch of toffee linger towards the finish. The finish is long, warm and creamy with vanilla, toffee and stewed apricots. Becomes pleasantly dry on the tail with prickling oak. There's more yellow fruits coming through with a splash of water. Fragrant and sweet with vanilla and more malted barley. Still strong on the palate although the vanilla and toffee sweetness dominates. Less fruity with a spicy core of white pepper and prickling oak. The finish is long and slightly warming with creamy apricot jam, toffee and dry oak. 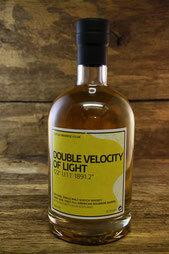 This is a young, lively and very strong Speyside single malt. Fragrant, fruity and sweet on the one hand, but uncompromising, powerful and intense with a significant alcoholic bite on the other. Not everybody's darling I suppose. But I like it!